Three battle-tested ALA Gym warriors are ready to face determined Mexican opponents in a fight card aptly titled “Fists of Fury” on Saturday at the University of South Eastern Philippines Gymnasium in Davao City. ALA Gym head trainer Edito “Ala” Villamor told the Manila Standard/Viva Sports that Jason Pagara, Genesis Servania and King Arthur Villanueva have been training at the Manny Pacquiao Gym in Davao for the past two weeks and are ready to wage war if they have to, against tough Mexican opponents. Undefeated super flyweight Villanueva who is ranked No. 3 by the IBF, No. 4 by the WBO, No. 7 by the WBA and No. 12 by the WBC was a disappointment in his last two fights although he won and will face the toughest test of his career when he takes on former world flyweight champion Julio Cesar “Pingo” Miranda. ALA Promotions president Michael Aldeguer told us he wants to see whether Villanueva has the potential to earn a title shot and facing ‘Pingo’ Miranda is the best way to finds out. The 34 year old veteran Miranda has a record of 38-11-2 with 29 knockouts and had fought some of the best in his career including former two division world champion Brian Viloria to whom he lost the WBO flyweight belt in Honolulu on July 16, 2011. Miranda captured the Mexican bantamweight title with a majority decision over Fernando Aguilar last November 14. Aguilar was beaten by Villanueva in a ten round bout last year. In one of his best showings in recent years Miranda gave former light flyweight and flyweight champion Hugo Cazares a scare before losing in a WBC International super bantamweight title fight on December 7, 2013 in a fight where Miranda forced the action and refused to take a backward step throughout the bout. Also on the 29th edition of the tremendously successful “Pinoy Pride” series telecast over the giant broadcast network ABS-CBN light welterweight Jason “El Nino” Pagara ranked No. 4 by the WBO and super bantamweight Genesis “Azukal” Servania who is rated No, 1 by the WBO and No. 9 by the IBF, will be tested perhaps to a slightly lesser degree than King Arthur by their Mexican opponents. The 26 year old Pagara who has a record of 34-2 with 21 knockouts is coming off a successful fourth title defense of his WBO International title against resilient Mexican Mario Meraz, scoring a TKO with one second remaining in the 4th round when referee Danrex Tapdasan called a halt despite the fact that Meraz beat the count, raised his hands and indicated he was ready to continue last June 21. Pagara had won the title with a smashing 6th round TKO in a rematch with menacing-looking Rosbel Montoya who had won a unanimous ten round decision to grab the WBO Asia Pacific Youth title on September 10, 2011. 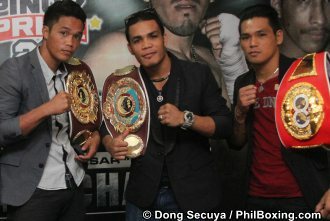 Pagara will battle 27 year old Cesar “El Dolar” Chavez who has a record of 23-7 with 11 knockouts. Chavez is coming off a rousing 3rd round knockout of Javier Gallegos last October 3 and had earlier won the vacant Mexican Pacific Coast light welterweight title with a 5th round TKO of Fernando Hernandez on December 29, 2011 but lost by a 4th round knockout to Roberto Ortiz in a WBC Silver title fight on February 4, 2012. The undefeated 23 year old Servania who has a record of 25-0 with 11 knockouts apparently faces a tougher challenge than Pagara when he battles the 32 year old “Black Pearl” Juan Luis Hernandez who sports a record of 17-3-1 with 9 knockouts. After a layoff of more than three years Hernandez returned to the ring and scored what Mexican media described as a “difficult victory” over Pedro Palma last November 14 winning by a unanimous decision in a fight where Palma came with everything in search of victory and threw punches from all angles while Hernandez connected with far more effective blows. In a clash for the WBC International super flyweight title Hernandez engaged Carlos Rueda in an epic ring war that was considered Tijuana’s “Fight of the Year” in 2008 in a bout in which the “Black Pearl” dropped Rueda twice in round two but was himself dropped in round seven and lost by TKO. Photo (L-R): Jason Pagara, Genesis Servania and Arthur Villanueva will headline 'Pinoy Pride 29' in Davao on Feb. 7. Photo by Dong Secuya.